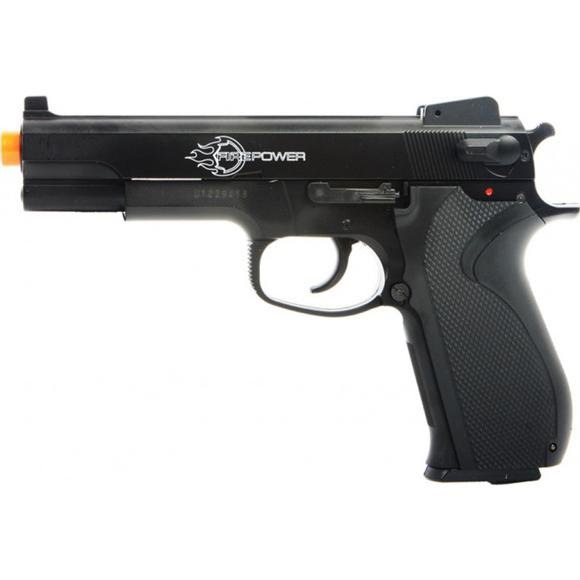 The Palco Firepower .45 Spring Powered Airsoft Pistol is a proud member of the Metal Slide Series of Airsoft pistols possessing favorable characteristics such as a more realistic weight and feel. The innovative BAXS shooting system, and an anodized special spring for high power supply plenty of power and accuracy when you need it. Traditionally, every company has used a hop up system with two points of contact (top and bottom), allowing Airsoft guns to shoot to the left or to the right. With the BAXS system, Palco put three points of contact, (two at the top and one at the bottom) spreading the weight of the BB evenly, causing the accuracy of the Softair® Airsoft gun to greatly improve and the Softair® Airsoft gun to shoot straighter. Spring-powered Airsoft guns use energy in a compressed spring to &apos;fire&apos; an Airsoft pellet down the barrel of the gun. Because the spring must be re-compressed before each shot (achieved by &apos;cocking&apos; the gun), spring-powered Airsoft guns are limited to a single shot, and are therefore incapable of semi or full automatic modes of fire. Typically, spring-powered guns are not as powerful as gas, CO2, and electric guns. The main advantage to using spring guns is that they don&apos;t depend on an external power source; you don&apos;t have to re-charge a battery, refill with Green Gas, or switch CO2 cartridges: they are self reliant. They also tend to be more reliable in cold weather.